Mala Sinha is a veteran Bollywood actress who has worked in Hindi, Bengali and Nepali films. She was a top leading actress in 1950-1970's. Learn more about Mala Sinha wiki age husband family son details here. Mala Sinha's real name is Alda Sinha, Mala was her stage name. She was born on 11th November 1936 (82 years old) in Calcutta (Now Kolkata), West Bengal, India. 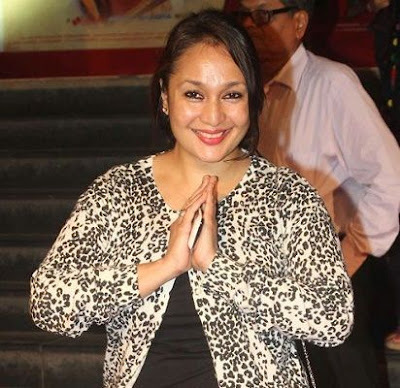 Alda Sinha was born into a Nepali family. Her father's name was Albert Sinha. Her father was a Nepali Christian. She moved to Calcutta for studies. She is married to Chidambar Prasad Lohani who is a Nepali actor, they shoot "Maitighar" in 1966 and fall in love. The couple has one daughter Pratibha Sinha, who is a former Bollywood actress. She is 5ft 2inches tall and weighs over 68 Kg. This beautiful veteran actress has black eyes with black hair. She completed her studies from Kolkata (formerly Calcutta), India. She showed interest in acting from her childhood days. She started her career as child artist in Bengali films- Jai Vaishno Devi followed by Shri Krishan Leela, Jog Biyog and Dhooli. Bengali director Ardhendu Bose saw her acting in a school play and took permission from her father to cast her as a heroine in his Bengali film Roshanara (1952), her cinematic debut. After doing some Bengali movies she went to Bombay (Mumbai) for shooting of a Bengali film where she met Geeta Bali. She introduced Mala to director Kidar Sharma. Though her first to films- Badshah (debut) and Ekadashi didn't do well but her lead role in Kishore Sahu's Hamlet, fetched her rave reviews in spite of it failing at the box office. In 1957, noted Bollywood actor and director Guru Dutt cast Mala Sinha in his film Pyaasa (1957). After Pyaasa, her major successes were Phir Subah Hogi (1958) and Dhool Ka Phool. She was part of many successful movies from 1958 to the early '60s such as Parvarish (1958), Ujala, Main Nashe Main Hoon, Duniya Na Mane, Love Marriage (1959), Bewaqoof (1960), Maya (1961), Hariyali Aur Rasta, Dil Tera Deewana (1962), Anpadh and Bombay Ka Chor (1962). She woned numerous awards for her acting in Bengali and Hindi films. Her favourite actor is Raj Kapoor and favourite actress is Nargis. She love to listen Lata Mangeshkar's songs. Her original name Alda sinha, however her friends called her Dalda for which she changed her name to Mala Sinha.